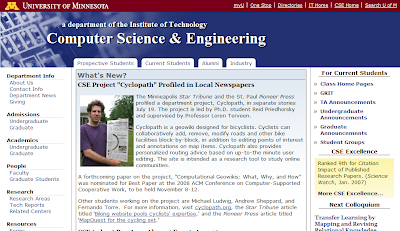 Further publicity for Cyclopath: The project is (well, I am) on the front page of the CS Department web site. (Click for image for bigger.) Cool huh? These news items also display on flat panel monitors the department has wasted thousands of dollars on installed throughout the building. Mushrooms: In other news, I have another flush of mushrooms going -- 4 mushrooms, perhaps more. Pics on harvest sometime in the coming days.